I've found that as I've increased the size of the bass drivers beyond 12 inches in my speakers, the room has increased its complaints. These complaints have been voiced largely in terms of slight imaging problems. Maybe a "spot the bass trap" competition is in order...? I had a similar complaint with my Ushers in their previous (too small) room. Imaging wasn't great but the worst problem was boomy bass which loaded up the room on some music and couldn't always be followed easily. I ended up stuffing the rear ports which helped a lot but denied me some of the floor-shaking bottom pedal notes from organ music. My experiments with bass traps were not successful, the room was fundamentally too small. I know this now as my current room is much larger and the quality of the bass is transformed. Same speakers, hugely better sound. It can even happen with small speakers but in a kind of reverse way. I had my Mezzas in a fairly small room and tried everything to achieve a balance between decent bass and good imaging but all attempts failed, plumping for reasonable image and less bass. I then moved the system to larger room and after very little fettling everything snapped into place rather nicely. Pretty much opposite to the assumption for small speakers! Still at the playing around stage (traps and Lego). Will report back when I have something more meaningful to report. 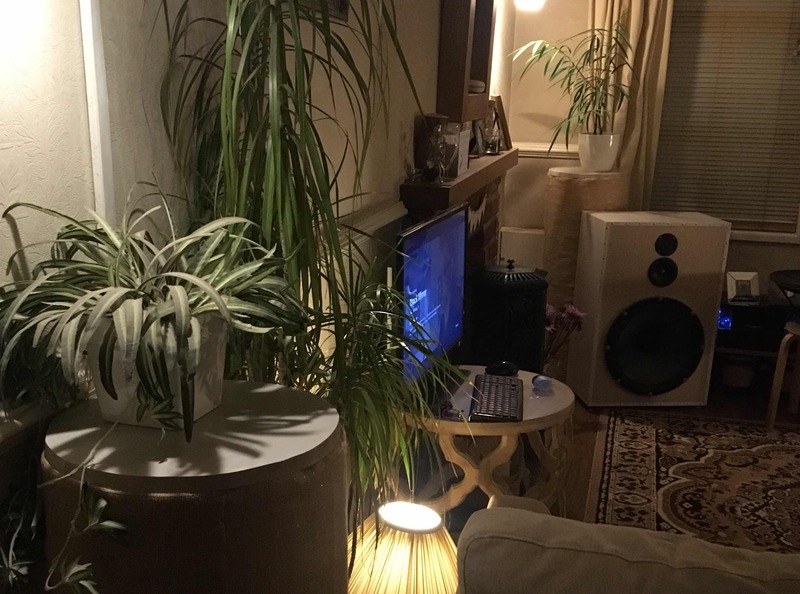 I suppose it's all about the particular relational dynamic between a particular pair of speakers and a particular room. I haven't played around properly with smaller speakers (i.e. 2 way bookshelfs) in my current room, ever. Dave's visiting next month with his beloved Royds, so I'm really looking to see how they get on in my space. That will be an interesting comparison. As I noted in the other thread, they live in a very similar space to yours. I've always liked listening in the nearfield (which I think works well for every Royd). Listening across the shorter dimension of the room gives the loudspeakers some distance from side walls. Direct sound from the loudspeaker then reaches the ear significantly before first reflected sound arrives. That won't help much with room nodes and modes though.. but it's great for timbre and imaging. When I got 'grown up' speakers, my main goal was to retain the monitor like qualities of the Royd RR3, mainly wrt imaging accross a very wide soundstage. The Triangles did, and now do so even better. Identical setup to the RR3 though. I will always aim for imaging over bass - every time! Interestingly Colin thinks I should have these even closer to the back wall for more bass reinforcement. Ben, I imagine that the height of your woofers from the floor is absolutely critical with those cabs. I'd be trying everything from on the floor to five feet high! I'd also experiment with a DIY cabinet: mid and tweeter firing forward, and woofer facing the ceiling on top. James (Sov) and I discussed doing that with Magisters many times. Yes, it’s surprised me how much imaging matters. What you write about original sound v reflections resonates with stuff i’ve been reading and trying to absorb. I think the large 18 inch drivers i’ve used in these ones are of a size prone to wide dispersal, and so more reflections. I’ve had a bit of a shift around over the last couple of days. Nothing as radical as rotating the listening plane as you suggest, but I’m now much happier with how things are sounding. Experimenting with the bass traps seems to have freed up my mind more generally to try out new speaker positions. I still haven’t got my head around what the traps doing exactly, but they’ve set the cat amongst the pigeons. I’m no longer insisting on the speakers being completely locked to the projector screen. Both the bass and the imaging seems to have progressed, so not having to choose completely between those two. Love the upward firing driver idea. I’ve been looking for something weird to inspire my next DIY build.